HighPoint Packaging: HighPoint Packaging is commercial wrapping paper manufacturer. Our newest All Occasion line. Our newest All Occasion line includes themed giftwrap for Birthdays, Kids/Juvenile, Floral & Feminine patterns, Wedding, Valentine’s Day, Bold/Masculine, Weddings and other Special Occasions. 'Tis the season for Christmas themes. From traditional holiday prints with holly trees and winter themes, to whimsical Santas and playful Snowmen, our collection of Christmas themed wrap is one of the largest available with thousands of patterns to choose from. 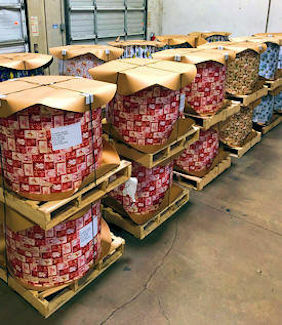 We have a large inventory of clearance wrap available. We have a large inventory of clearance wrap available in various sizes across all categories: Retail Rolls starting at 10ft in length an up, 85ft cutter Rolls, 433ft Half Reams, 833ft Full Reams, and even printed mill rolls available (as is) or converted to any size finished product. Contact us today for current quantities and pricing. We create special wraps for schools and fundraising programs. Many of our wraps in this category are reversible prints and focus on Christmas and holiday themes. This collection offers a vibrant selection of themed patterns. This collection offers a vibrant selection of themed patterns from hearts to cupids, metallic inks to soft pearls, and everything in between to make this Valentine’s day extra special. Do you have a custom gift wrap in mind? Send us your art, logo, school name, or even just your idea, and we will help you create a masterpiece. We can help with all custom order and personalized wrap. Our state-of-the-art manufacturing facility, located in Dallas, Texas, enables us to provide you with quick turnaround on all of your orders, helping to minimize your inventory investments, while maximizing customer satisfaction. Whether you are a Service Wrap Retailer, Retail Distributor, Fundraising Distributor or Specialty Retailer of gift wrap paper and accessories, we have a program for you. Our art driven designs are created by highly experienced artists in the social expression industry, and all of our designs are created with an emphasis on style and color trends. With thousands of patterns to choose from, our design categories cover all occasion prints, along with every season, holiday and special occasions. PROUDLY MADE IN THE USA. OUR FOCUS IS CUSTOMER SERVICE, THE HIGHEST QUALITY PRODUCT AND SHORT RUN TIMES. THOUSANDS OF DESIGNS TO CHOOSE FROM ACROSS ALL CATEGORIES AND EVERY OCCASION. Our state-of-the-art manufacturing facility, located in Dallas, Texas, enables us to provide you with quick turnaround on all of your orders, helping to minimize your inventory investments, while maximizing customer satisfaction. Whether you are a Service Wrap Retailer, Retail Distributor, Fundraising Distributor or Specialty Retailer, we have a program for you. Your customers will always receive fresh, creative designs that set you apart from your competition. Small run options at long run prices! Great designs to choose from with small minimum order requirements. You can be confident in the knowledge that you and your customers will meet your financial objectives in each campaign. Minimize space requirements; easy set-up minimizes time for your sales associates on the floor. Highpoint is an official member of several associations affiliated with the gift wrap industry. Showcase your respect for the environment with our Well Managed Forest paper, TPCH compliant products, and paper content printed with water-based inks.